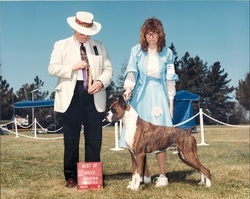 Gentry Boxers, owned by Paula and Jeff Vandervoort, was established in 1973 (originally named Jafra Boxers), with our first AKC show dog “Jafra’s Diamonds and Rust”. From that time, we have been actively showing, training, and breeding quality AKC Boxers for pet and show homes. Paula is an alumnus of Arizona State University in Science and Animal Physiology, with emphasis on biology, genetics, animal reproduction, and animal science. She is also trained in holistic modalities for support of dogs including homeopathy, energy support, flower essences, raw diet, and intuition. She is a student of the American Council of Animal Naturopathy, and presents workshops to veterinarians and breeders teaching breeding, rearing essential oils, homeopathics, and natural rearing. She does Animal Communication as well. Paula has served as President, Board Member and PR Representative for the Sacramento Valley Boxer Club and as Board Member and Bench Show Chairman for the Boxer Club of Arizona. Paula is currently a member of the Houston Boxer Club and its parent club The American Boxer Club. We have raised many beautiful Boxers over the years who have not only been wonderful family pets, but also successful in obedience, agility, search and rescue, disaster recovery, lure coursing, nose work, and conformation competition. This is a re-do of the original web site, and there are far too many show, obedience, and competition Gentry dogs to pull from the past, so just a small representation of them are on this site just to give the viewer an idea of what to expect. We are located in the Houston TX area.